A Few Scraps: My new book is out: Giveaway! Party in Portland! My new book is out: Giveaway! Party in Portland! Today Amazon says it is shipping my new book. Happy happy, boing boing! Thank you to those of you who already left reviews on the Kindle version, you rock! Leaving a review is so helpful, especially with a new release. It's a very kind thing to do for an author, so thank you. My beloved Portlanders, let's get together and talk about how much free-motion quilting makes us quiver, yeah? My amazing, kind, generous, and talented friend Nancy Stovall at Just Quilting is hosting a book signing party at her longarm studio. We will have snacks. We will have a longarm ready for you to play with - his name is Manny and you will love him. I will have my books to sell (yes, even with a credit card, because I finally got a square reader!). If you already have purchased a copy bring it on by and I'll sign it! And if you're not in Portland, I haven't forgotten about you. I love you! So much that I want to give away a copy of this book to one of you, so how about I do that now? The giveaway is open to you no matter where you live. Leave a comment, any comment on this post to enter. Please make sure I have your email address. If you are a no-reply commenter someone else will get the book you should have won because I won't be able to reach you to tell you I drew your name. Wouldn't that be sad? Yes, it would. Leave me your email address if you don't know what a no-reply commenter is because you might be one! Update: The giveaway is now closed. Well that's it! I'll close entries and draw a winner on Thursday 1/29. Comments are now closed and a winner has been drawn! I would love to win your book! I need all the help I can get. I've heard about your book on a couple of different blogs and cant wait ti read it. I really hope i win a copy from you. THANKS FOR SHARING IN YOUR GIVEAWAY AS WELL! I'M GOING TO LEARN TO FM QUILT ! 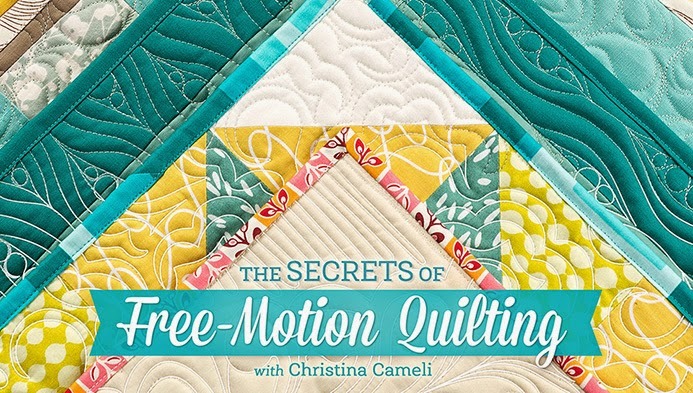 This sounds like a really good book to get me off dead center and try to do this free motion quilting. I've been following your blog for a long time and always enjoy reading it. I would love to try some of your techniques. I could really use the help. Your books sounds great, I can't wait to see it. And I hope I'll be able to stop by the party on Friday. looks great. love to have one please. Congratulations and wish I could be there to celebrate with you! I have your first book and your second one looks amazing. Congrats! I sure wish I lived in Portland, and even though I have the ebook version I'd love to win a "paper" copy. Thanks for the chance. I would love to win this for my guild's library. Want to come do a trunk show/workshop in sunny Victoria? Not kidding, email me! Congrats on your new book! I love the first one so much, this one is sure to be awesome! Congratulations are in order! I wish you the best! Thanks for a chance to win! I've been practicing my FMQ and it's mostly doo doo. :O/ I could definitely use your book! oh my!!!!!! I want to win this book...thank you for the chance!!! I have and refer to your first book all the time. Looking forward to working with your second one. Congratulations! I have seen your book reviewed by several bloggers that I follow and would love a chance to win your book. I am a visual learner and your book looks to be perfect to add to my library. Can't wait to try some of your designs. I am so ready to start my FMQ adventure. Winning this book would be a huge help. Thanks. I struggle so much with how to quilt things. I would love to win your book. 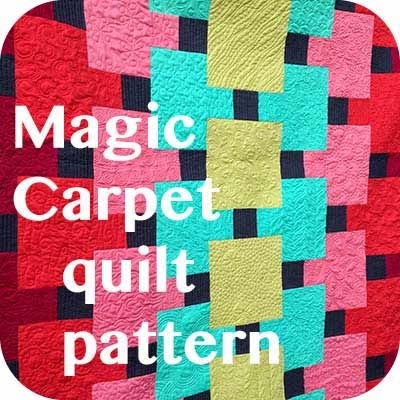 I love all your blog FMQ tutorials so I'm sure I will love your book. Congratulations! Friday the 13th is during our shop hop, here. Congrats on the new book. I really need to sit down and practice, practice, practice. congratulations! I know the book will be great! Congratulations on your new book. 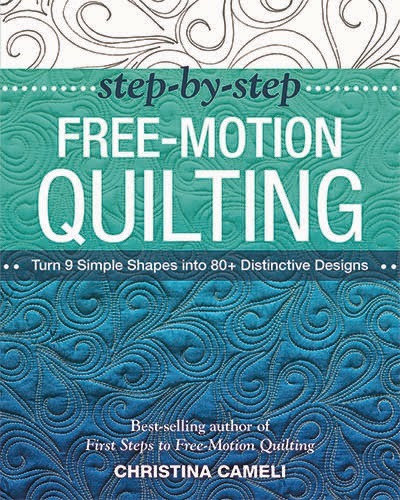 This would be a great companion to your book First Steps to Free-Motion Quilting, which I already have. Congratulations on the new book! I can't wait to see it in person. Thanks for the opportunity to win my own copy. Congratulations on your new book! I would love to win a copy. I have a question about your book: do you recommend that I read your previous book first? Thanks! I've learned so much from your first book and look forward to your new one. Congratulations! You are a gifted gal. I've read great reviews on your book already. I hope I win, but if not, it will be on my "to purchase" list. Congratulations on your book. Very Exciting! I am taking your new Craftsy class and it is awesome! You are a very talented lady. Congratulations on your new book! Just in case I am the book winner my email is rjwoehlke@aim.com. Loved your Craftsy class - excited to check out your book! I'd love to win a copy of your new book - thanks. Loving your Craftsy class, would love a print copy of your book too! Congratulations and thanks so much for all you do. Congrats on your book! I'd love to win a copy. Thanks for the chance! Congratulations on a job well done. Your book is on my wish list! Congrats! I could use some more pointers and design ideas. I'm a FMQ newb. Congratulations on your book. It looks really nice. Thanks for the giveaway. What a great accomplishment! I would love to have a copy! Hope you have a great party. Am currently enjoying your online Craftsy course. Would love to receive a copy of your new book. I've been following your blog for a while, and waiting for your book to come out! Thanks for the chance to win! Thanks for this giveaway. Hugs from Spain. Looks like a fantastic book! Thanks for the giveaway. "Turn Nine Simple Shapes into 80+ Distinctive Designs"- now that sounds enticing! Congratulations on your new book! I wish I lived in Portland! Congrat with your new book, looks very interesting. And I m not living in Portland sadly. beautiful photos - great idea for a book. Congratulations on being published. Thanks for putting my name in the hat for the drawing! I would be so happy to win this book, looks very interesting and inspirational . 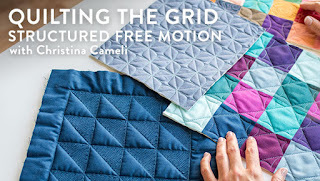 Would so love this book my free motion quilting needs all the help it can get. I've read some great reviews on this book. Would love to win it!! Congrats on your new book -- happy, happy -- but FMQ is definitely not boring for me! Thanks for the chance to win. Shahann at yahoo dot com. Looks like a great book! Another to add to my growing FMQ collection :) Have a great party. Congratulations on your book and thanks for the inspiration. Congratulation Christina! Whoop Whoop from northern NY (near the Canadian Border) from someone who loves your quilting style so much that I just purchased your book this past weekend. It's wonderful, Thanks!!! 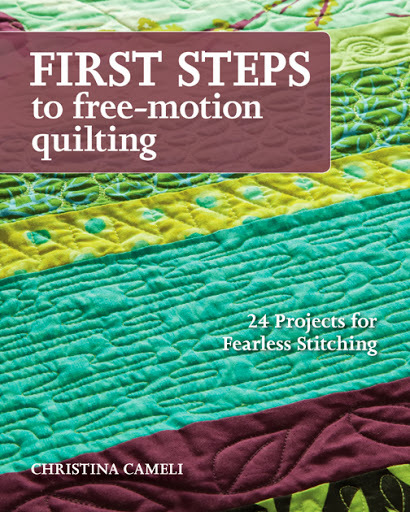 I just realized I bought your first book, First Steps to free-motion quilting, not this one. Would love to see this one in person. I am excited to see your book, so thank you for the opportunity to win! Congrats! Would love to win this book. Thanks! I love your first book so the second one would be icing on the cake. Congratulations one more time! Would love to win a copy of your book! Love you and your great work Christina! A second one! Congrats.....know you are proud and excited. Me , too, for you. I love reading your blog, trying out the FMQ designs you share. I can't wait to see you 2nd book and would love to win one! Congratulations! Thanks for the chance to win a copy of your book. I would love to win your book. Thanks for teaching on Craftsy. Would love a copy of your book to inspire me to get back into more quilting again and to give me new ideas - thanks for the opportunity! I love your designs that you so generously post in your blog and am sure your book is just as inspiring. Congratulations on being published! Congrats! Can't wait to get your book! I would love to have your book. Then I could free motion quilt like the pros. 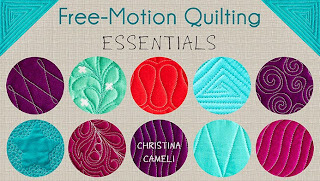 I'm a newbie at free motion quilting so I would LOVE your new book! I'm looking forward to this book-however I get to read it! Congratulations! Congratulations on your new book. I would love to be the winner, so I could improve my quilting. And it's a fab book too!!! Don't pick me cause I've already got one ~ just had to leave a comment! See you at Nancy's! YAY!!! Congrats on your second book! I would LOVE to win it. I have your first book on my nightstand and I love the inspriation and what I've learned (and quilted) from it! Congratulations on your latest publication~you rock my quilting world and I would totally love to win this book. Congrats on your new book, hope it is a quick "sell out"! Congratulations! I am needing so much help with the FMQ part of quilting! I am a newbie to FMQ and I really need help. My son got me your first book for my birthday last year, so I'd love to have this second one! Congratulations. Love your blog and find it very helpful, the book would be wonderful. Looks like a book I need in my library. Hope I am the winner! How exciting! I remember the thrill of my first book being published. Congratulations! I love your first book and your Craftsy class; would be thrilled to win the new book and continue learning from you. Congratulations on your book! What an accomplishment! I really need to work on my FMQ - this sounds like just the ticket! Congratulations on your new book! I've read about it on a couple other blogs, and it sounds like it's awesome & pretty much fool-proof....just what I need. I started my adventure in FMQ just a couple of weeks ago, and boy, oh boy, do I have a lot to learn! Your book sounds like exactly the help I need, so thanks for the chance to win it! Congratulations! I'm sure it is amazing. I would love to take a closer look! Congratulations. Would love to win your book. Your book is on my wishlist - I'm loving your class. Congratulations on your new book. I'm learning a lot from your Craftsy class and I refer to your book "First Steps..." all the time. Thanks! Now I wish I lived in Portland. Sounds like a fun party. Thank you so much for both of your books. Just got back from ordering both of them from Amazon. Am a new quilter/sewer/piecer and am so impressed with your down to earth writing and instructions. Having watched all your videos so far, I know the book would be helpful too! Thanks for the Chance! I would love to win a book. I have learned so much from you already through your blogs and videos. I would love to win your book. I have taken a course recently and really need help to master free motion quilting, Thanks for the chance. Congratulations! What an accomplishment and thrill for you. Wish I were in Portland so I could visit, try out Manny and meet you in person. I am so happy you have a book--I am hooked on learning FMC and want to "soak up" every little bit of it I can. I really want to learn FMQ and I'm so nervous to start. This book could be the friend that walks me through it. Congratulations on your new book. I would love a copy. Love your work, your instructions are so easy to follow! Congrats on the new book, I will be getting one either by winning or purchasing one. Hope I win!!! Lucky if I could have it at home. I just saw this on instagram! I want and need this book! I would love to win your book! Congratulations on its publication! What a great accomplishment! I certainly want a chance to win your book. Just to be sure, I'm placing your book in my shopping cart on Amazon so I don't forget to get myself a copy if I'm not the lucky winner. I don't know if this already posted but I pre-ordered the book and it should be here Friday! But I'd love to win one to give to a friend. 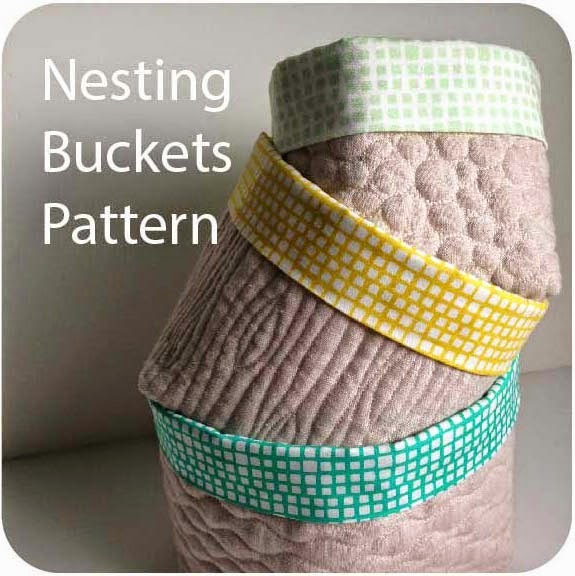 I love your YouTube videos and seeing how we can really quilt on our home machines. Me encantaría poder ver su libro, seguro que tiene acolchados muy interesantes. Gracias por la oportunidad. I would love a copy of your book! Wish I was in portland. I loved your Craftsy class and would now love your new book! I love your style of quilting! I'm a L & D nurse, so all the more reason for me to win your book! Haha! Congratulation on your new book! It looks amazing, I would love to have it. Congratulations on your book - I would love to win a copy! Your book looks great and I would love to win a copy to try out your techniques. I'm so excited to check out your new book! I've already tried the lily pad design that someone posted on IG and it was awesome. Congrats girl! congratulations and thank you for the chance to win! I'm excited to check out your new book! I sew want to improve my quilting skills. This would help a lot. Congratulations on the book. Many many congratulations on the publication of your book! I'm looking forward to purchasing your new book! I enjoying your website and appreciate that you share your knowledge and talents with us. Thank you! Love your first book and am really looking forward to this book too! Christina - I'm so happy for you! I would lovelovelove to win a copy of your second book! If I don't win it, I'm certain to buy it when I have some work and money again. I have been learning free motion quilt for about 4 months know! Some are great looking some aren't so good, I just check out your book on Amazon it looks great just what I need! Thanks for a chance to win your great book! I practice, practice, and practices, is there any other advice that you can give to me, or something else that I need to get to learn free motion quilting! Congrats on the new book! You should be proud of yourself and I'd sure be proud to have it. I am so looking forward to your book. Thanks to IG I was able to learn about your blog and saw another IG post about your book. Good luck at your book party. Congratulations on your book release!! I need a copy of this so badly so I can get my fmq skills in a better place! Congrats on your book release! have a wonderful time at the party! I have your first book and love it and am following your Craftsy class too. 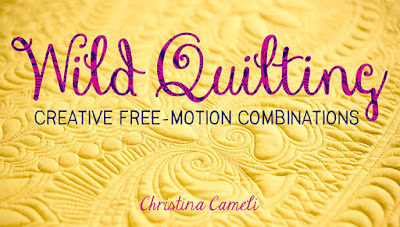 One way or another I am determined to master the art of Free Motion Quilting! Thank you for all the tips and hints you give for free. Congratulations, I'm looking forward to learning from your new book! Will either win or buy your book,but hop to win it. Thanks for the chance. I received my copy of your book today and it's fabulous. I'd like to win a copy so I can donate it to my guild's library. Ohhh, I'd love to win a copy of your book! Definitely time for a party to celebrate! I have your first book, so I should definitely get your second book - a set! Congratulations! Enjoy the wave. Congrats on the new book, and thanks for the opportunity to win! Congratulations on the new book! If I win, could you please sign it for me? I just got a long arm machine and I need this book! I would love to win. I would love to win this book! I really feel inspired by your designs and your approach, but most of all your enthusiasm! My email is moldilocks@hotmail.com. Moldilocks, by the way is my tortoiseshell cat. I really don't have such low self esteem. Thanks for the chance to win your new book. It looks like an awesome resource to add to my library. If your book cover is any indication of what is inside - I think it's going to be a winner! Loved your craftsy class and your designs. I'm sure the book will be filled with more great patterns! I'm loving your Craftsy class, and I'm sure your book is fabulous! I love your first book and this one looks great, too! Thanks for the chance to win a copy. Congratulations on your book! It looks wonderful! I wish I lived close to Portland so that I could party with you! But alas I'm in Wisconsin, so I hope you post pictures for our vicarious enjoyment. Thanks for the chance to win! A book would be inspiring! Love to FMQ...just stopped to watch some TV. Congrats Christina! So excited to see your new book! Congtraulations on your book release . Have enjoyed following your blog for some time now. Congratulation with your book. It looks great and I'm sure it would be fun to have a copy :-D Have a great and creative day. Daaang, look at all those comments! :) I don't need an entry to win your book because I already bought it and it came today! I love all the new designs in the book and I can't wait to start stitching some of them, now that my beloved Juki is finally back from being repaired. Congrats on Book #2! I have heard wonderful things about your teaching. I would love a copy of the book!